The courses are held at our Training Centre at Ty Mawr Farm, Llangasty near Brecon in mid Wales (LD3 7PJ) Click here for directions. How can I find the Training Centre? Directions to Ty Mawr Farm can be found on 'ABOUT US' on main menu. Introduction start at 8:30am with tea/coffee, the courses start at 9:00am prompt. Yes, we provide a good, home cooked lunch in the middle of the day and refreshments (tea / coffee / cakes) throughout the day just to keep you going. When you book you will be asked if you have any particular dietary requirements. You should wear suitable work clothes and footwear as there is a large practical element to the course. Protective equipment such as safety spectacles and gloves will be provided. All tools and protective equipment are provided, for the duration course, but some craftsmen like to bring their own tools. You may also want to bring samples of mortar / photos of your own projects if you want to discuss specific issues. 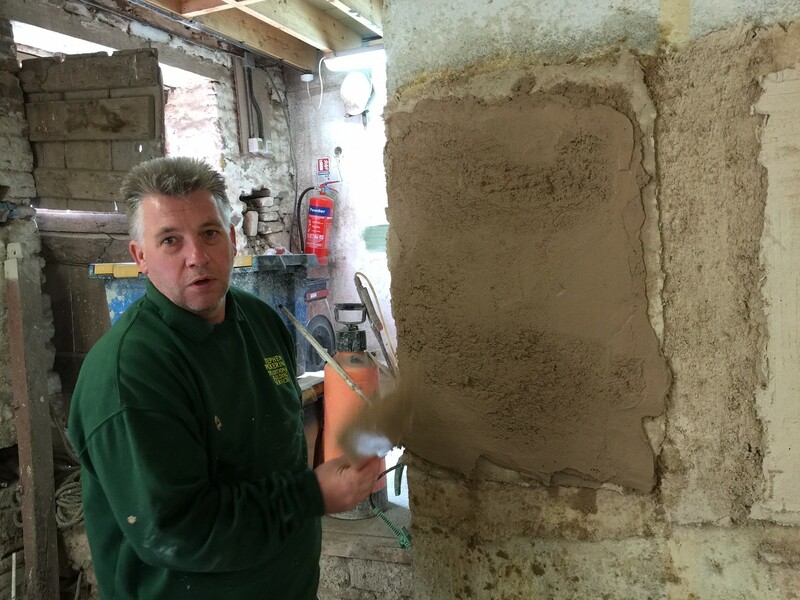 On lime plastering days we try to keep a maximum of 6 participants to 1 tutor. This is the reason why our Lime Plastering Courses are more expensive than the Introduction to Lime Courses. We use a variety of tutors, all of whom are working lime plasterers running their own contracting businesses. What will I have learnt by the end of the day? The course aims to give you a full understanding of how lime plaster works and an introduction to application procedures. Is any written information supplied to take away? Yes, as part of the course you will be given a copy of the recently produced 'Ty Mawr Lime Handbook', a 92-page practical guide that normally retails at £15. The introductory talk at the start of the day has been accredited by the Royal Institute of British Architects (RIBA) as part of their Continuing Professional Development (CPD) programme. The course is not assessed but we do provide an attendance certificate. Is the course linked to the new Heritage Skills CSCS card? Not directly but a lot of the material is relevant and provides good, underpinning knowledge and understanding for elements of the NVQ in Heritage Skills. Why are the courses more expensive than some other providers? We know that our courses are more expensive than some other providers but we make no apologies for this as we feel that the content and quality are second to none. Many of the reasons for this have been given above such as the RIBA accreditation, the use of very experienced tutors drawn from across England and Wales, the provision of the Ty Mawr Lime Handbook (RRP £15), not to mention the location and the food! This is supported by the feedback received in 2009.